In his Ketab-e Iqan, Baha’u’llah cites a prophetic tradition about four characteristics of four different prophets, that will also be characteristic of the Qa’im, the promised messiah of the Shiah tradition. The last of these characteristics, the one the Qa’im shares with Muhammad, is “the revelation of a Book similar to the Qur’an.” Baha’u’llah gives his source as the Behar al-Anwar, a huge compilation of mainly Shiah traditions, the life work of Mohammad-Baqer Majlesi, who died around 1700. The Behar became a standard work of Shiah scholarship, especially in the 19th century. 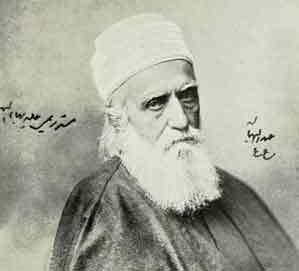 Contemporary Shiah apologists have made the citation in the Iqan a point of critique, because the form Baha’u’llah cites differs from its form in the most widely used modern edition of the Behar al-Anwar. This tablet from the pen of Baha’u’llah was translated by Zia Baghdadi and published in Star of the West Volume 10 no. 1 (March 21, 1919). I am posting it here so that it is accessible to search engines, and for the benefit of those who have not (yet) purchased the Star of the West CD. A section is translated by Shoghi Effendi in Gleanings from the Writings of Baha’u’llah, section CXLVII and I have inserted this into Baghdadi’s translation.